The 1803 Pine Needles & Berries Candle has cranberries blended with a comforting spice & notes of enhancing, citrusy orange created scent. The welcoming scent beckons guests to your door & family to linger ‘round the kitchen table. Delivery time: If this item is in-stock it will arrive in 3 to 7 business days from our shop. Trim wick to 1/4"-bend wick into and out of melted wax to extinguish (no smoke using this method). Be sure to shop our other 1803 Candles & Scents! 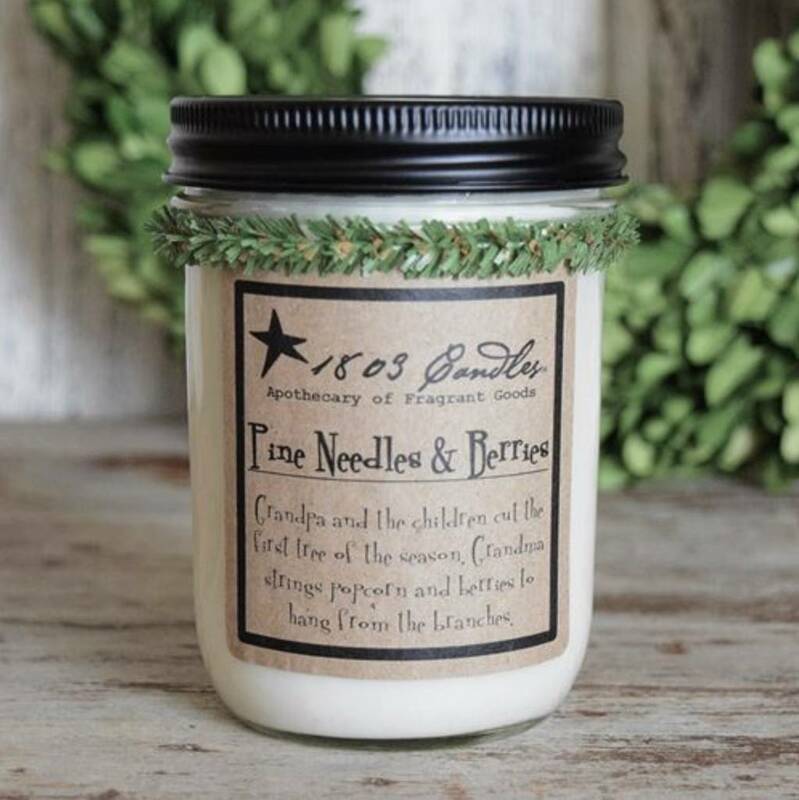 Thank you for choosing to shop with us and considering our selection of 1803 Pine Needles & Berries Candle! Contact us with any questions you may have or call us during regular business hours at (314) 846-6262. Sign up for our Nana’s Email List! Nana’s Email Pledge: We promise to never share your information or fill your inbox with countless emails. Our emails will be about Special Offers, Events or the products we know you love. 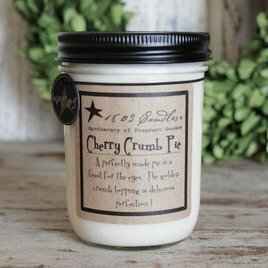 The 1803 Cherry Crumb Pie Candle reminds you of watching grandma make her famous pie crust. Warm cherry filling & flaky pie crust! This fragrance of warm, bubbly, cherry pie with a flaky crust & sweet crumb topping is a delicious scent for a busy kitchen! The 1803 Cider Mill Candle is a crisp, apple scent of freshly milled apples. Holding true to the past the Cider Mill’s sweet, tangy apple notes will put you at the apple orchard on a cool, fall morning. With 1803's Nutty Pumpkin Waffles Candle Sunday mornings with a steaming cup of coffee curled up with the newspaper will never be the same. A fall favorite that draws family to the breakfast table, Nutty Pumpkin Waffles will become a family tradition. The 1803 Orange Caramel Scone Candle is a celebration with pops of cinnamon that complement the sunny fruit blended into the thick pastry & melt momentarily on your tongue. The crunch of the crystalized sugar finishes each heavenly bite.